For the non-professional, wine tastings are events to be look forward to. For a relatively small fee (£25 – £30), you get a chance to try a range of wines, some of which you wouldn’t normally consider buying. The organisation hosting the event gives you some indication of the types of wine they will be showing but, after that, you are left to negotiate the offerings on your own – with no particular sales pressure applied. The tastings have a ‘club’ atmosphere, where all can exchange opinions, swap information and, maybe, place an order. And drink wine, of course. Having recently attended two Birmingham tastings within the space of ten days (The Wine Society’s and Lay & Wheeler’s), we thought you might like to read our opinions – a sort of horizontal tastings tasting, if you get what I mean. The WS had a broader selection, in both styles and price and, correspondingly, a greater number of attendees. So much so, they ran out of the liquid stuff! (they did partially reimburse all attendees for the inconvenience). L & W’s was a smaller affair (circa 40 people) and a more limited selection (10 Merlots and Cabernets as opposed to the WS’s 18 reds and whites). L & W’s prices ranged from £30 to £97 per bottle whilst the WS went from £7.50 to £37 pb. Two distinctly different markets were targeted and yet there were some people present at both. As L & W made clear, their wines were for the future and this was apparent in the choice of grape varieties on offer, although the presence of Merlot meant a wider drinking window was available – although some of their wines were only available to buy in 6s into bonded warehouses. The WS adopted a more consumer-friendly approach, all wines were sold duty paid and subject to the Society’s minimum order. Should L & W have chosen the washrooms to taste in? Then we would have been packed even tighter. Both L & W and WS, how can you hold tasting notes, pencil, wine and write notes whilst standing up? High tables needed. WS, why show uninteresting wines? We know what a cheaper NZ Pinot Noir etc. etc. tastes like. Complexity a must. L & W, why show such a tightly similar range? More breadth? Both L & W and WS, to prevent crowding why not spread the wines i.e. L & W 2 tables, WS 2 tables for each grape selection? We’re being picky, we know, but these questions may be asked/answered ‘in house’ AND we did have to pay for the tickets. However, we enjoyed both evenings. To both WS and L & W, thank you for your staffs’ efforts. First a Régnié, tasted with some old friends in north London, over some delicious meatballs. ‘Artisan’ producer which often doesn’t mean much but here it was clear that a lot of care had been taken over this wine. 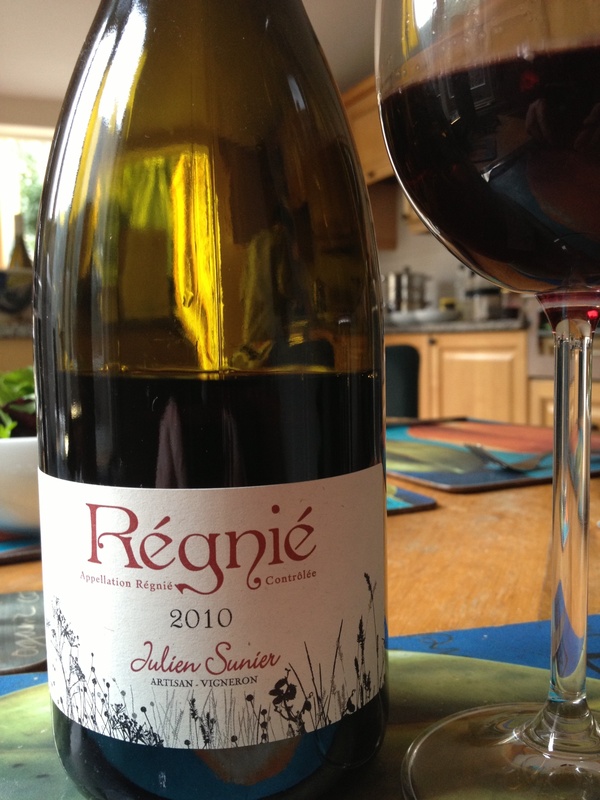 Pure, some spice, quite lean, Gamay nose and absolutely delicious. From Berry Bros, about £14. 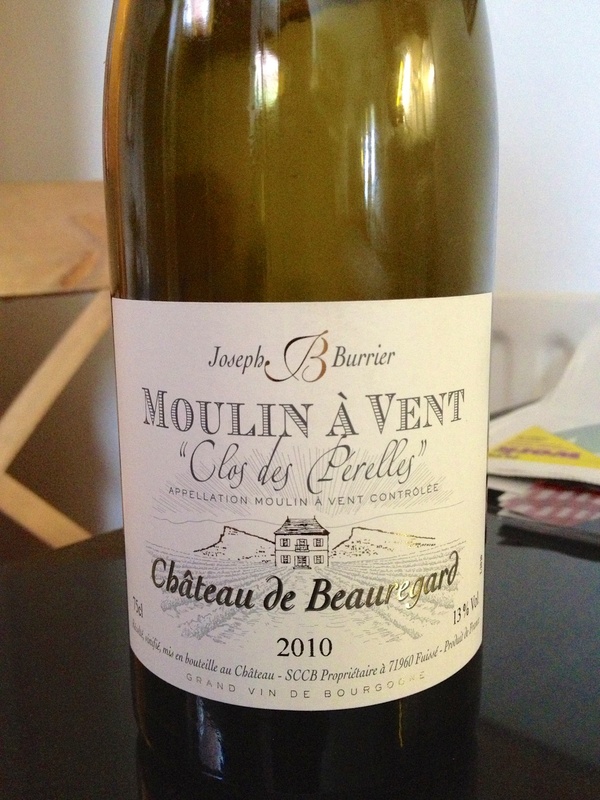 Then, at home, a Moulin Á Vent Clos des Perelles, Chateau de Beauregard. This one from the Wine Society, same price. Very different, big, fleshy, full flavoured with no deterioration on day two. Probably needs a bit more time in bottle. An interesting comparison. The Wine Society recently (Mon. 11th Feb) held a tasting at The Burlington Hotel in Birmingham. Entitled ‘Six of the Best’, it had the school discipline overtones that Michael Gove would have approved of – so Richard and I, exercise books stuffed down our trousers, attended. The swishing six grape varieties featured were Sauvignon, Riesling and Chardonnay for the whites and Pinot Noir, Cabernet Sauvignon and Syrah for the reds. A class of better behaved pupils you’d have difficulty in finding. Potentially, there would prizes for all. But the three Sauvignons, Ch. Reynon (Bord), Brunia (SA) and Sancerre, were all disappointingly D graders and left us still searching for good Sancerre. The £27 Chavignol 2007 offering seemed to be lacking fruit. The Rieslings, a WS Exhibition, an Eden Valley and Wehlener Sonnenuhr Spatlese were an improvement. The Aussie wine had the typical behaviour characteristics of a forward nose, racy freshness and a gravelly finish but was a touch hard at the end. This was a great contrast to the raisiny fullness of the Moselle. I thought the German wine had a slight spreckle. It suited my palate but Richard did not like the sweetness. Definitely good B streamers for me. The Chardonnays (St Veran Vernay, a Sonoma and Meursault) were top of the white class, by virtue of the Meursault Meix SLC, Fichet 2007. Mind you, at £37 per bottle, I would expect graduate material. It had a deep nose, was savoury and a lovely weight in the mouth whilst retaining some refreshing high notes. An A* grade. The red class started rather poorly. A Sancerre Pinot Noir, a Martinborough PN and a Marsannay all struggled to make the grade. My notes read “Nothing to recommend it”, “typical NZ, pleasant” and “Great Pinot nose but rather thin”, respectively. Could do better, WS. The Cabernets were a definite step up. A 2006 Medoc (Ch. Patache d’Aux) was still a bit tight but the De Martino Legado Reserva 2010 Chilean offering had an attractive sappy nose and an excellent balance of acidity and fruit on the palate. The minty nose of a Weinart 2005 from Argentina, plus its liquorice, yet fruity, palate was good value at £9 per bottle. 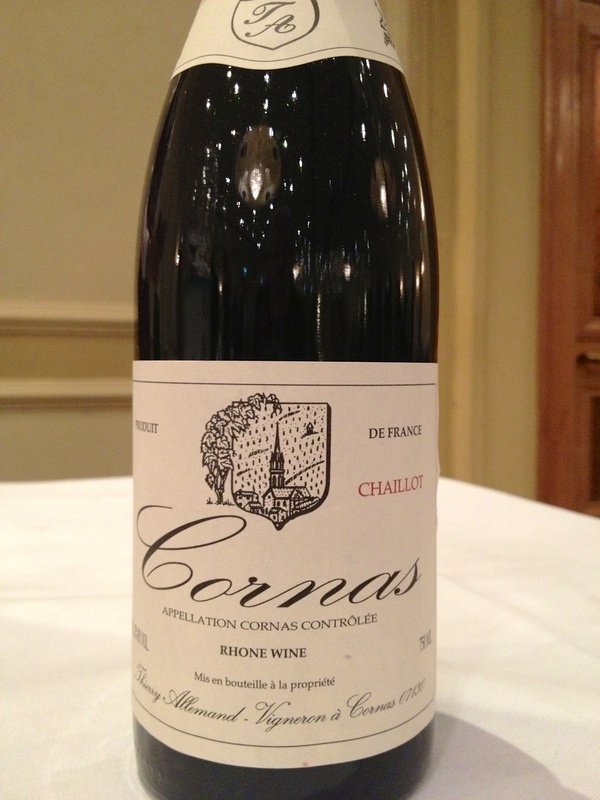 Most ticks from me were awarded to the Syrahs – an Ardeche 2011 (great nose, will develop), a Aussie d’Arenberg 2010 and a Cornas Thierry Armande (2001). 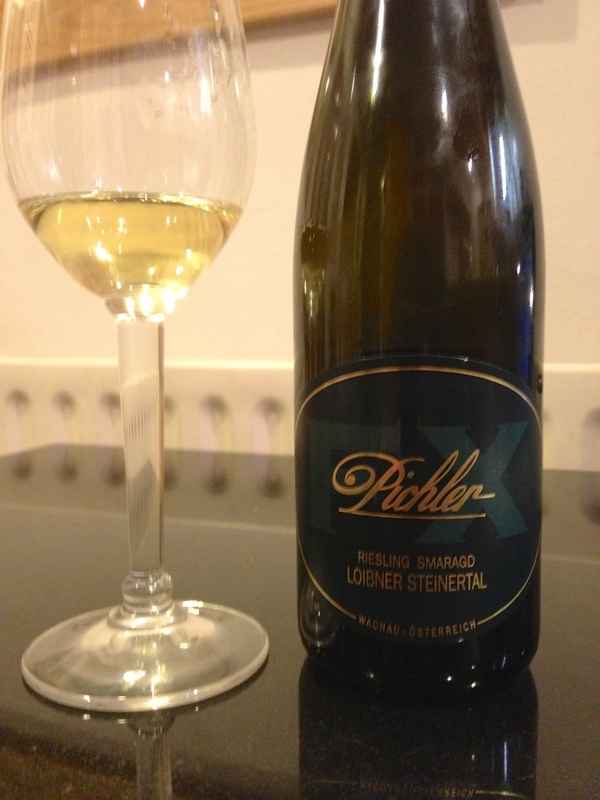 The latter was a really well made wine – grassy, fresh, plenty of vigour even now and will continue to improve – university material, undoubtedly. Six of the Best? A detention for the Sauvignons and Pinots, the Rieslings are on target whilst the Chardonnays, Cabernets and Syrahs all had gold stars. By Gove!! 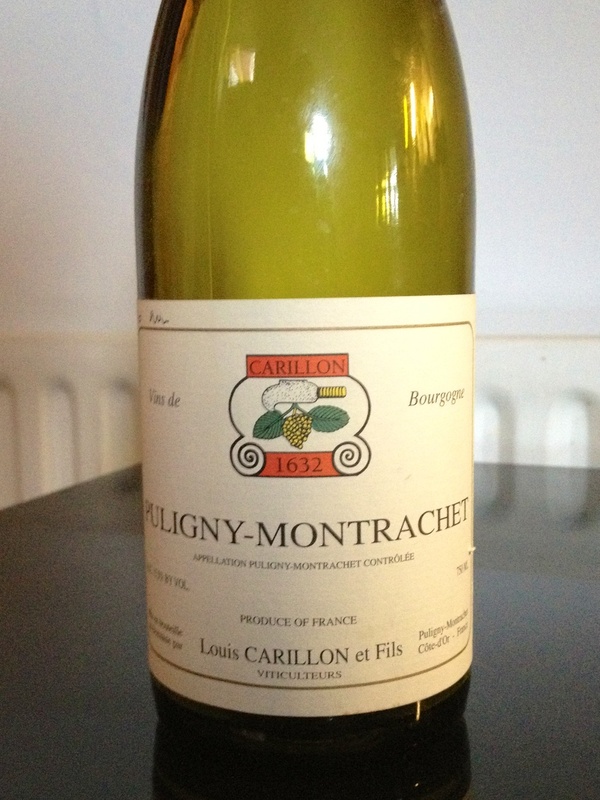 To start with the conclusion – we both expected more from this wine – 2004 Puligny Montrachet from Carillon. However, it did have its interesting points, the first of which was a very bright green-yellow colour with plenty of viscosity. 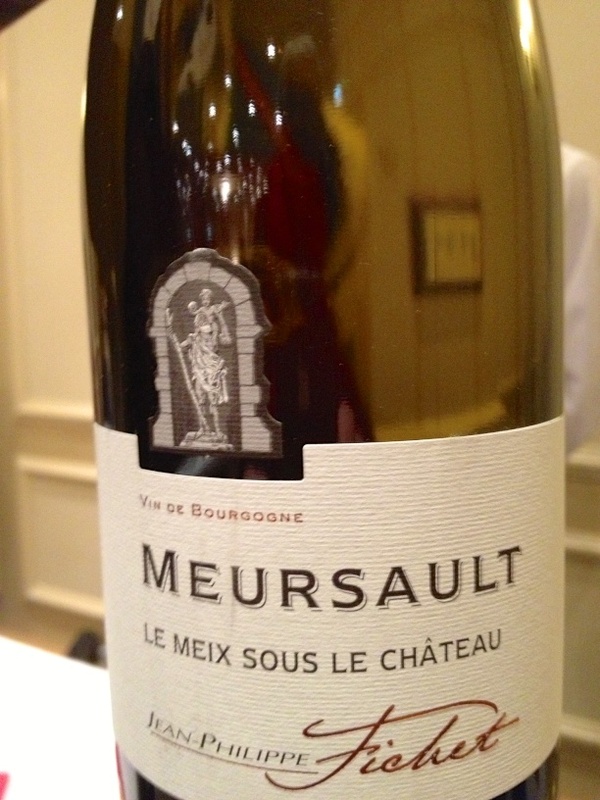 The clarity suggested quality and a lack of filtration which we had seen before in more expensive white Burgundies. The bottle was brought in from a cold conservatory and, not unsurprisingly, the nose was a little shy but we could detect citrus (grapefruit) notes and a subtle freshness that was attractive. As the wine warmed, the creamier aromas started to show and the notes became more complex. Richard suggested it had a lanolin bouquet. This wine really illustrated the importance of temperature; the not realising of the full potential of more complex white wines when they’re too cold. The taste was of lemon sweetness, developing into a nuttiness as the evening progressed and the front palate was of a big wine with some weight in the mouth. So far so good, however – and here’s the disappointing bit – it lacked any real staying power in the mouth and rather faded away to its dry finish as did our expectations. 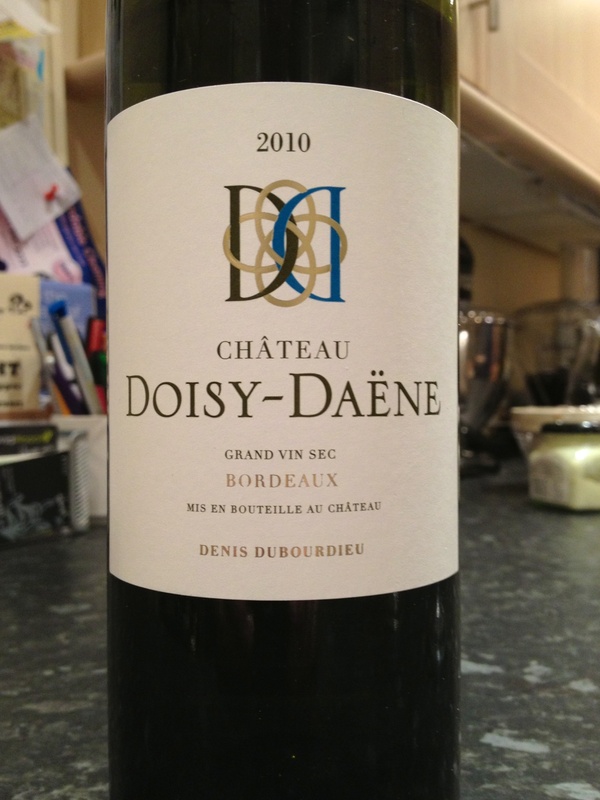 Pardon the vulgarity of the title but it was Richard’s précis of the 100% Sauvignon Chateau Doisy-Daene 2010 from the Wine Society (£15). The dry sister of the famous Barsac, this is an excellent wine and – unfortunately – has sold out. So there – you should have bought it earlier. The colour is clear, bright pale-green with some viscosity (13% alc). On the nose it is fresh lemons with the vanilla nose of some oak ageing and quite different from the ubiquitous Sauvignons from NZ. The palate was clean and dry, full flavoured with good length, very slight oak and refreshing acidity. This is a well-made wine from a good producer – classy, but with some edge to it to keep it interesting. I have one bottlle left and will be looking forward to the 2011. Excellent with any fish dish or as an aperitif, this would be good for a blind Sauvignon tasting – just for the fun of seeing who places it. White Bordeaux, as has been stated, represent very good VFM at the moment. Long may it continue. Once in the glass, the bright lemon colours were clear and there was some viscosity to show for the 13% alcohol level. The nose was aromatic but also reminded me of the grassy tones of a Sauvignon but there was more sweetness than that grape variety. There was none of the characteristic kerosene Riesling bouquet. (It was a blind tasting). The palate gave away its Riesling qualities – it was dry, with a gentle acidity that didn’t dominate but rather refreshed its richness. It had a weighty mouth feel and we both agreed it was a very well made, distinguished wine. It still had some years to be enjoyed before its dotage – and even then would still be attractive. But exciting? Classy – without doubt. It had roundness, balance and even freshness, a great food wine – as well as an aperitif. But exciting – I’m not so sure of. It lacked a nervy edge which it was probably never designed to have. A safe pair of hands, beautifully manicured. Comments Off on Class or excitement? In December we published a piece entitled ‘Drinking Windows’. It illustrated, rather sadly, the risks of looking for a bargain, saving it for the special occasion and then opening it too late. (There is also an article in Decanter about the optimum drinking times). So – on to another ‘bargain’. This time from Wine Rack, their Ch. 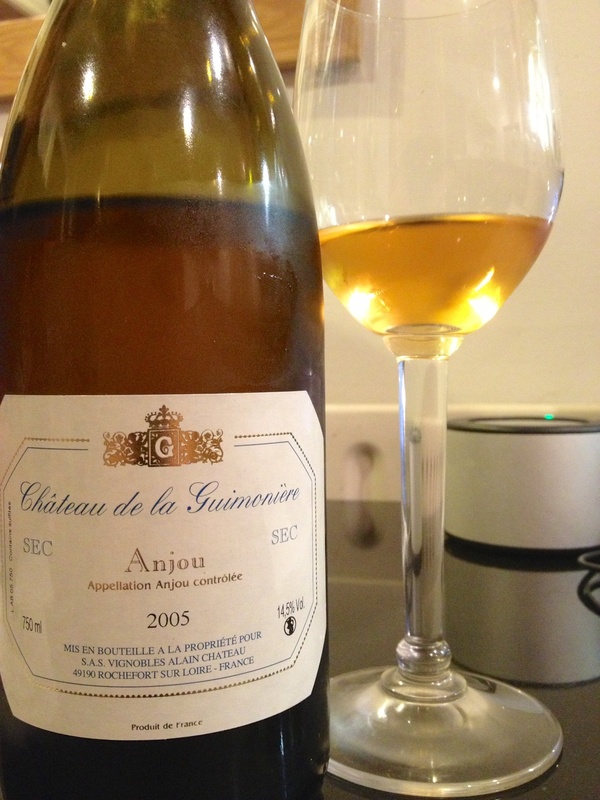 de Guimoniere 2005 Chenin Blanc from Anjou. (£8). Richard collected this recently, no doubt being aware of the staying qualities of Chenin Blanc. Mmm. Colour – deep orange but still clear and bright with some viscosity. On the nose we could detect the slight honey tones but with balancing citrus coming through. The palate showed that this was a well made wine that had seen better days. We gave up after a glass each – life’s too short etc. etc. Doubtless, we’ll still bargain hunt on those shop shelves but shouldn’t the outlets also be regularly checking stocks to ensure quality is maintained? If it had been an old vacuum cleaner I would expect it still to do its job. Why should wine be any different?